Millefeuille can mean different things in French…Originally millefeuille is a traditional dessert sold in many bakeries, made out of two layers of crème patissière (custard) and three layers of puff pastry. It’s called millefeuille because of its many foldings of its puff pastry (which contains a lot of layers), obviously this millefeuille has nothing to do with sweets and custard but it does some layers too, so we call this a millefeuille (literally meaning thousand sheets). After one delightful week of no fish and no seafood just vegetarian meals, I somehow found myself with a raw fillet of salmon left that I had from a previous dinner, which needed to be cooked, or would end up in the garbage, which is something that will never happen in my house. That would be sinful to throw away food in general and salmon even more so. After thinking and thinking about how to hide this fish in a dish, I finally decided to go with a millefeuille, because first of all it looks pretty, then you can barely see the salmon, so millefeuille, it was going to be! As far as artichokes are concerned, it’s one of my favorite vegetables, so I use them whenever I can. Pomme de terre Anna is a traditional dish in French cuisine but most precisely Parisian cuisine, potatoes thinly sliced and cooked in the oven with a little melted butter and rock salt. They seem to have been created in Paris in the 19e century by the Chef of the “Café Anglais”, Adolphe Dugléré, who fell in love with one of its beautiful client Anna Deslions, and called them Pomme de terre Anna. Funny how love can boost creativity! They became since then a very famous potato dish! You can serve them as a side dish just in their cute round shape, but I love to play with food and today they were my toys. Then to add the final touch, I made a jus de persil. I was hesitating between a jus de tarragon, then I figured I would leave the tarragon for something else, and parsley would go quite well here. Alors voilà, c’est fini!.. and this is definitely French no need to even think about it! There are a few different steps in the process but it’s a fairly quick dish to make, so even if you don’t have too much time, it’s really worth trying it. It’s a delightful dish! Bring 1/2 cup of broth to a boil, add parsley and cook for 30 seconds, remove from the pot and pat dry. In a blender, mix parsley with broth to make it into a very fine mixture. Remove from blender into a bowl, add 1 tbs olive oil, 1 tsp lemon juice, salt and pepper if needed. Start preparing the potatoes. With a mandolin, slice potatoes, pat them dry. In a small ramequin or round silicon mold of about 3 inches diameter, place slices one on top of the other. Using a brush, spread some melted butter on top and sprinkle with rock salt. Cover with a silpat (silicon sheet) if using the silicon molds or with aluminum paper if using a ceramic ramequin. Also if using a ramequin, it needs to be greased first or the potatoes will stick on the surface. Cook in a pre-heated oven at 375F for about 30 minutes. While the potatoes are cooking, trim the artichokes, cut the hard green leaves around the artichokes and the top, cut them in quarters then in small slices. Squeeze lemon juice to prevent them from staining. Heat olive oil in a pan, add garlic, stir, then add artichokes and wine. adjust with salt and pepper, cover and cook until the artichokes are tender. Add tomatoes to the artichokes, cook for a few minutes, then add vinegar. Stir well and let the mixture cook for a few additional minutes. Add chives. Assemble millefeuille. 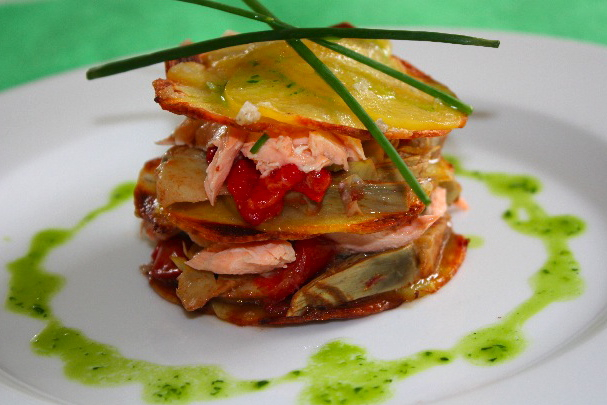 In a plate, place one potato piece, add one layer of artichokes, then add salmon. 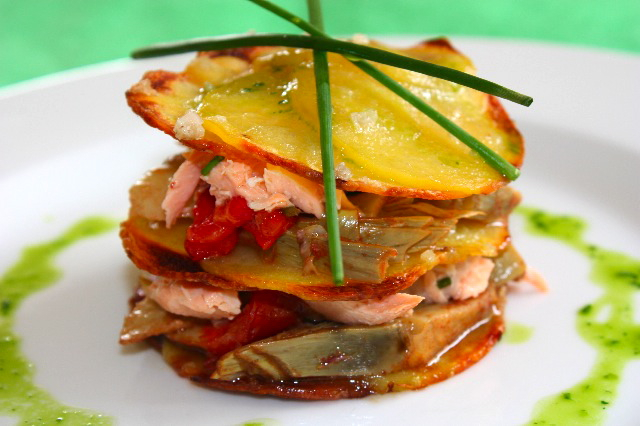 Proceed with another potato piece, artichokes and salmon. Sprinkle with parsley jus and serve some extra on the side. This entry was posted by silvia on April 27, 2010 at 9:20 am, and is filed under Fish/Seafood. Follow any responses to this post through RSS 2.0.You can leave a response or trackback from your own site. oh my these combo’s you come up with are outstanding, wonderful love salmon and now with two more of my favorites, over the top! Great job saving the piece of salmon. I love pomme anne I make them all the time. The parsley jus…perfect. Wonderfully balanced dish. You are a culinary genius! Wow! Looks yummy! I’m saving this beauty! How beautiful! Lovely flavours, too. As always, a gorgeous dish made by Silvie. Oooo…this is absolutely perfecto! I think I need one of this too…! Hmm..mm…. Enjoy, dear! This is just too hard to resist. Just beautiful Silvia! As I’m reading your post/write-up I can taste it and now very hungry. Gourmet at its finest!! These photos are spectacular. Did you know??? These photos are mouth-watering! I’m printing this post right now. I love love love this dish… so many perfect things together… I can’t wait to make it. I love that it is for 2… so many of us like to make great food of an evening with our partners/husbands/wives and not just for company… this is a perfect dish for that! Wow this looks so tempting and delicious! A truly beautiful and elegant creation! I love all the delicious layers here! I don’t even care for salmon unless it’s raw, but your photo grabbed my attention. What a gorgeous presentation. Brava! What a work of art! This is gorgeous. The flavours you have stacked together sound delectable and the idea itself is really one that is possible to do – and look so elegant and professional – and IMpossible at the same time. Thank you for the idea and lovely photo and recipe!